In 1974, shortly after my 21st birthday, I drove to New Haven, Connecticut with some film-buff friends to attend something called Cinecon 10. It was advertised as a convention for devotees of silent and early sound movies. The core membership was comprised of private collectors who shared 8mm and 16mm prints from their holdings. Musical accompaniment for the silents was provided by other members whose themes tinkled from old, indifferently tuned pianos. In a small hucksters room other hobbyists sold and traded a variety of wares: films, posters, lobby cards, publicity stills, vintage trade journals, and related effluvia. It was the most fun I ever had on a Labor Day weekend. Now, 40 years later, I’m headed to Cinecon again. The group hasn’t missed a year, and the 2014 confab is its fiftieth. After several decades hopping from city to city, Cinecon settled in Hollywood permanently in 1990. The privately owned 8mm and 16mm prints have been replaced by theatrical-gauge 35mm prints sourced from private archives and the movie studios themselves. Instead of seeing the films in hotel meeting rooms, Cinecon attendees now view everything in the famous Egyptian Theatre, a silent-era movie palace restored some years ago. Among the items on this year’s program are several silent-serial chapters that I’ll be introducing. 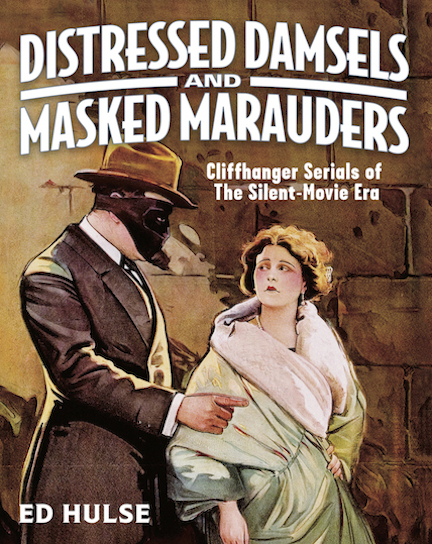 This, of course, will enable me to plug (and hopefully sell many copies of) my book on the early chapter plays, Distressed Damsels and Masked Marauders. Unfortunately, preparing for Cinecon — and other activities I’ll be undertaking while in Los Angeles — has prevented me from finishing some Murania Press chores I’d hoped to wrap up before leaving. So if I owe you something, please be patient and accept my apologies. I’ll be back home on Thursday, September 4, and will pick up where I’m leaving off tonight as I quit to pack for an early-morning flight tomorrow. Meanwhile, take advantage of this weekend’s special sale on DD&MM and The Perils of Pauline: Centennial Edition. It’s the next best thing to being at Cinecon and seeing those old serials on the Egyptian’s big screen.